Advantages: Succinct narrative; great and relevant photos, including some not seen before; logical structure; attractive illustrations; covers the human side in addition to the "big picture". US Naval Aviator 1941-45 by Robert Hargis is the latest book from Osprey Publications in their Warrior series. 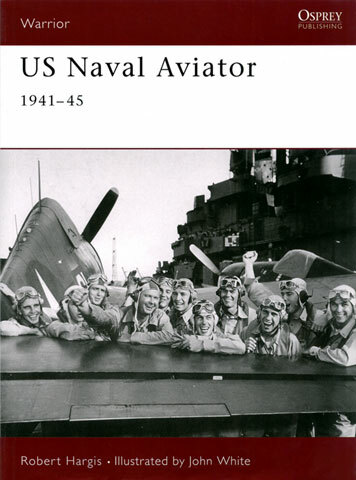 The title is pertinent; the book explains what occurred within US naval aviation during the fast-moving period of 1935 to 1945. The book's introduction sets the scene and provides you a brief but succinct key point history of naval aviation from Eugene Ely's first flight off the deck of the USS Birmingham in 1910, through the birth of the first US carriers from hulls originally laid down to be built as battleships, to the creation of new Atlantic and Pacific fleets as a result of the Naval Expansion Act of 1942. What follows is a year by year account of major actions and developments right up to the end of the Second World War in 1945. The introduction sets the scene. The author then goes back and fills in the human gaps to all of this history, with chapters on the induction and training of the naval aviator, what shipboard life was all about, the common beliefs held by naval aviators and sense of belonging and common purpose held by them all. Aircraft of the Fleet. The main types of aircraft used during the period, the F4F Wildcat, F6F Hellcat, F4U Corsair, SBD Dauntless, SB2C Helldiver, TBD Devastator and the TBF Avenger. The Weapons of the Naval Aviator. Machine guns, rockets, bombs, depth charges and torpedoes. The Carrier War, 1941-45: Air Tactics. The fighters, the night fighters, the dive bombers, the torpedo bombers, patrol and observation squadrons. Combat Air Operations 1944-45. Typical wartime strike mission, 1944. The book has many black and white period photos, most of them official ones from the US National archives. Whilst some of these will be familiar to the hard-bitten fan of US Naval aviation a great deal of them are new. Some of the illustrations are posed publicity shots. The best thing about these is the fact that the photographer has had time to carefully compose the subject and more importantly, get the depth of field and focus right. The cover illustration demonstrates this perfectly. Have a close look at it and the details jump out – the two whip antenna as well as the two navigation/identity lights on the spine of the F6F, the white overspray where the squadron painter applied the modex, the slight sheen of the paint on the horizontal stabilizer as well as details of the equipment worn by the pilots (funny how they seem to be ready to climb in and fly away yet both aircraft are wearing covers over their canopies!). Photos like these are invaluable to modelers and there are more of them within the covers of the book. The colour illustrations are a mixture of close-up details of pilot's uniform and equipment as well as artistic renditions of photographs. The book itself has 64 pages printed on glossy paper between thin cardboard covers and is the same size as the Aircraft of the Aces and Combat Aircraft series produced by Osprey. I found this book to be a good effort from the guys at Osprey that will appeal to the amateur historian as well as the modeler. It provides you with the overall "big picture" as well as the human of side of US naval aviation during World War Two.